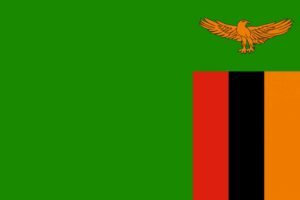 The flag of Zambia was hoisted for the first time at midnight on the 23rd October 1964, symbolising patriotism and the nation’s natural resources. An eagle in flight over three stripes of red black and orange on a green background. Red represents the struggle for freedom, black, the people of Zambia, orange the country’s mineral wealth and green the wildlife and environment. The eagle in flight symbolizes the freedom in Zambia and the ability to rise above national problems. 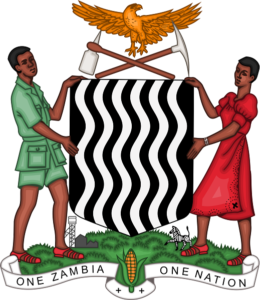 The coat of arms of Zambia is composed of an African Fish Eagle (the eagle of liberty) hovering above a pickaxe and hoe (representative of the country’s economic backbone). Making up the base are a Zambian man and woman supporting a shield depicting the Victoria Falls. Stand and sing of Zambia proud and free, Land of works and joy in unity, Victors in the struggle for the right, We have won freedom’s fight, All one, strong and free. Africa is our own motherland, fashioned with and blessed by God’s good hand, Let us all her people join as one, Brothers under the sun, All one, strong and free. One land and one nation is our cry, Dignity and peace ‘neath the Zambian sky, Like our noble eagle in its flight, Zambia, praise to thee, All one, strong and free. Praise to God, Bless our great nation, Free men we stand, Under the flag of our land, Zambia praise to thee, All one strong and free. REGIONAL: African Development Bank, Common Market for East and Southern Africa (COMESA), OAU, Southern African Development Community (SADC).